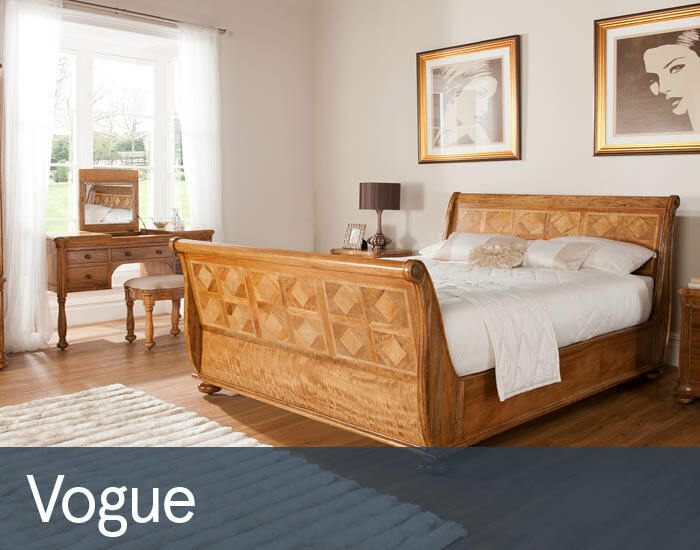 Radiating style and grandeur like no other, the Vogue collection provides everything you need to make your bedroom a functional, attractive space. The Vogue collection is made from premium quality mango wood and given a distinguished finish. The items also feature a decorative stone inlay which gives them a stylish look. With attractive finials, the king size bedstead will take pride of place in any well decorated bedroom. Alongside the bed, a pair of the bedside chests - which have 3 large drawers and a tasteful design, will provide ample storage for any bedroom essentials. The Vogue collection also includes 3 chests of drawers, any or all of which can be used to bring a wealth of storage space to your bedroom. There is also a dressing table with a really useful lift-up mirror, and a matching stool.